Also – per the question your posted on your blog, I wanted to get back to you about the size/volume of the Demi. Space-wise it is 80% the volume of the regular SousVide Supreme, but depending on what you’re cooking, actual cooking volume could be as low as 60% capacity. 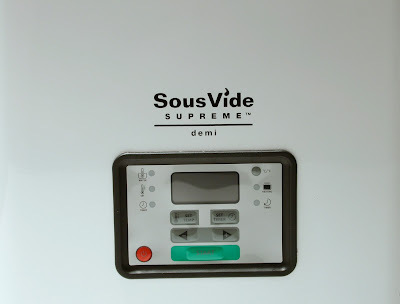 It would be accurate to say that depending upon on the size of food portions being cooked, the SousVide Supreme Demi has a cooking capacity of between 60% and 80% of the SousVide Supreme. The SousVide Supreme holds 20 four- to six-ounce portions of food. While the SousVide Supreme Demi holds up to 12 four-ounce portions of food; 12/20 = 60%. Check back soon for the part one of the review! Update: Part one of the review is here. Looking forward to your review. I'm trying to decide between the Demi and regular SVS right now. Not sure if the capacity would be an issue for me.